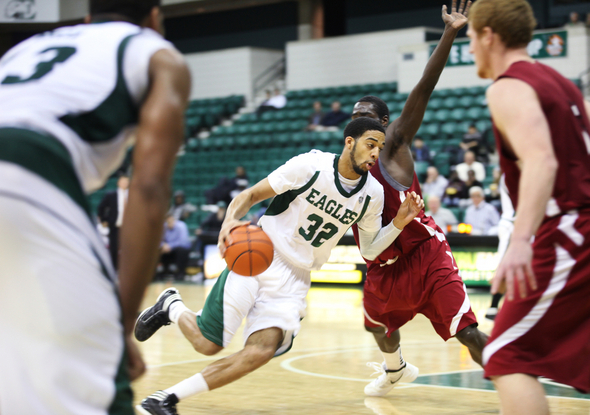 Posted on Wed, Nov 23, 2011 : 9:55 p.m.
Eastern Michigan's Jamell Harris drives to the basket in the Eagles' 62-43 win over Rochester College Wednesday at the Convocation Center. Led by 12 points, four steals and seven rebounds from J.R. Sims, the Eastern Michigan men's basketball team beat Rochester College 62-43 on Wednesday at the Convocation Center. It won't be this easy on Sunday. That's when Michigan State comes to town (noon, ESPNU). Eastern dominated Rochester early -- as a Division I team should when playing an NAIA opponent -- rushing out to a 16-2 lead and controlling every aspect of the game. That won't happen against Michigan State because the Spartans won't start the game 1-of-13 from the field with two missed free throws and six turnovers, as Rochester did. Eastern coach Rob Murphy is well aware. "We were giving up some good looks. Michigan State will make those shots and we have to make sure we’re in position to contest those shots," Murphy said. As it turns out, Rochester can make those shots, too. The Warriors (9-3) clawed back into the game near the end of the first half with a 13-2 run that spanned 8:18 and made the score 18-15 with just 1:45 left in the half. Eastern was just 1-of-10 shooting during the span. "We were up 16-2 and I think our guys got kind of lazy on the defensive end of the floor," Murphy said. Take a break like that against Michigan State on Sunday, and the Spartans will blow the doors off the Convocation Center. "Any time you’re up 16-2, it’s kind of tough on the execution side of things, and I think our guys kind of got a little lax, took some bad shots, and we missed some layups during that stretch as well," Murphy said. Eastern ended the half on an 8-0 run, including five points from Sims and a buzzer-beating 3-pointer from Antonio Green off an assist by Darrell Lampley for a 26-15 lead at the half. Green and Lampley each finished with 11 points. Lampley and Sims were too quick for Rochester in the second half, able to slash through the lane with ease and get to the foul line. Eastern finished 16-of-21 (76 percent) from the free-throw line. The Eagles' trio of rotating big men -- Matt Balkema (6-10), Jamell Harris (6-9) and Kamil Janton (6-10) -- were too big and too strong down low for Rochester, which has just one player taller than 6-6 on its roster. Eastern had a 39-31 edge in rebounding. That certainly won't be the case against Michigan State, renowned for its rebounding prowess and toughness down low. "There are a lot of areas that we need to work on (for Michigan State)," Sims said. "We’ll come back these next couple days in practice trying to get ready,"
On Sunday, Michigan State fans will likely fill the stands that normally sit empty at he Convocation Center. Nobody outside of the locker room gives Eastern (4-1) a shot against the Spartans (3-2), who beat Wisconsin-Milwaukee 68-55 Wednesday night. That doesn't much matter to the players inside the locker room, though. "We’re playing on our home floor, that’s always an advantage for us," Sims said. "We don’t ever think we should be counted out against anybody. We want to win every game, so we’ll just come in work hard get focused for the next one." Thu, Nov 24, 2011 : 4:47 a.m.
MSU by 20, only because Izzo won't run it up. I'll bet the convo doesn't fill for this one. No more than half full. Even state fans will sit this one out. EMU has to prove it is worthy of local fans coming out, even if MSU is in town.